Venus on the half shell – Mermonkey! Ideas for making stuff, writing or cooking often sit and percolate in my head for a long time. Making sock monkeys for the artists I work with at Seattle Opera is just one of those cases. Several sock monkey “contacts” happened about the same time to get the idea buzzing in my brain, and the first of those was my introduction to the amazing Mermonkey – here’s her story. The onstage actors in an opera that do not sing are called supernumaries, or “supers” for short. The most super of our “supers” at the opera is Miss Rosetta Greek. Rosetta is one of those people that everyone likes immediately – she’s beautiful, smart, is a phenomenal actress, an artist and has a great sense of humor and tells it like it is – always one of my favorite qualities in a person. She has turned her exceptional sewing talents into a thriving business – Heavens2Betsie – creating super hip cosmetic and toiletry bags, potholders, aprons and other useable art from vintage, retro and whimsical fabrics that she sells at the Pike Place Market in Seattle, cool kitchen and gift shops around the country and online. 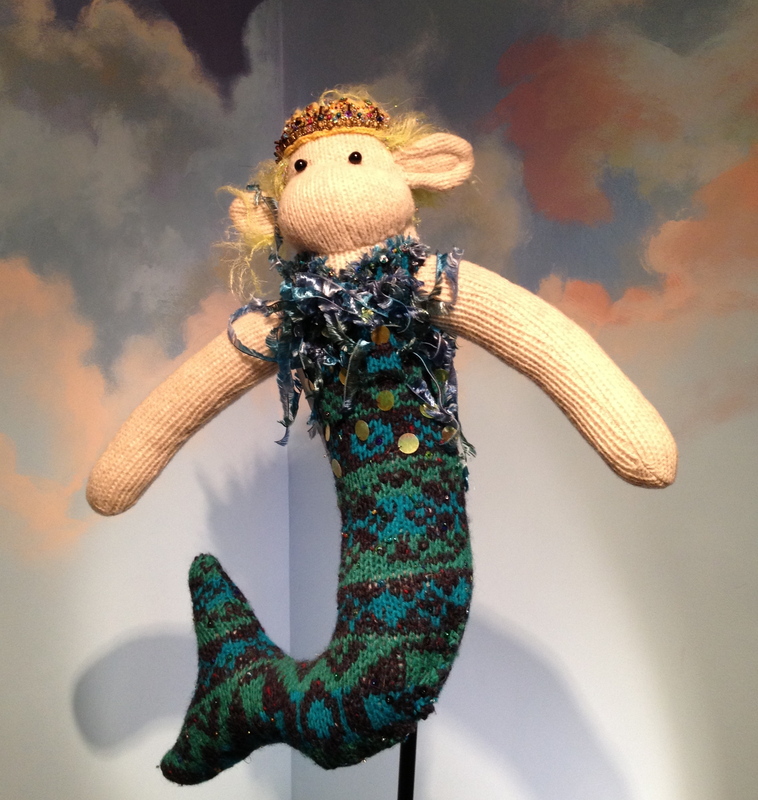 A few years ago during one of the shows, she was inspired to create her own mermaid sock monkey from a couple of funky ’80s sweaters she’d found at a thrift store. Over the technical rehearsal week and opening of the show, she would bring “Mermonkey” in to the dressing suite I worked in to update me on her progress, and I was totally hooked by the project. She eventually sold the beautiful Mermonkey, who Rosetta named “Atlantis”, to one of the principal makeup artists. Atlantis left behind this seed of sock monkey-ness that would not leave my head. I remembered my grandmother giving me a sock monkey she’d made me for Christmas when I was a kid, and I knew I was going to make one. About the same time, I was working as a home and gifts buyer at a local nursery in addition to my opera job. I was ordering calendars for the store and found a sock monkey calendar with pictures of vintage monkeys dressed in costumes, so I ordered one for myself. Shortly thereafter, I found an old pair of red heel socks at a thrift store and knew this was my sign to start making sock monkeys! A search on the internet for a pattern and, ta-da! I was on my way! The new 2012 Sock Monkey Calendar - gotta have it! So my thanks to Rosetta and Atlantis for their inspiration of what’s become a fun thing to be working on in my life. I’ve since made Rosetta her own monkey based on the ghost bride character she portrayed in the awesome opera Lucia di Lamermoor. Rosetta named her “Verboten” for reasons that will become obvious when you read her story – she’s one of my favorites and I’ll share her pictures soon. This entry was posted on November 29, 2011 by scootrah. It was filed under Seattle Opera and was tagged with heavens2betsie, Rosetta Greek, sock monkey.